A young King, about to meet his Queen for the first time is captured in this beautiful painting. He is nervous, yet excited and partly hides his face behind the fur of his coat, with his stunning hypnotic eyes holding your gaze. 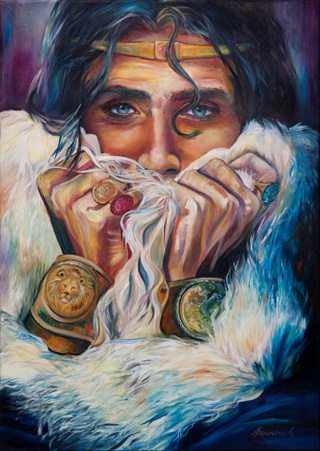 Fabulous blues and creamy whites work in contrast to his blue/black hair creating a very striking composition.